It’s not just a way to help save our planet. 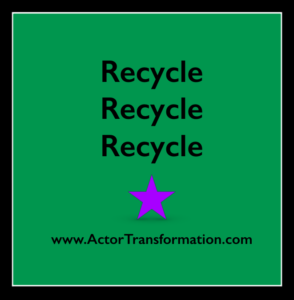 Recycling is also a great way to help your acting career! Let me tell ya… you are not alone. But actors often are not looking at every small career step forward as a victory. But it is! * Send out newsletters or email announcements. Want extra credit? You can even create a press release or get interviewed about your project. It is also vital to make the most out of any press that comes with the project itself. Big movies and TV shows usually have a built in PR machine involved with the project, but even a no-budget student short film might have a screening at the film school, or will hopefully at least get you an IMDb credit and some footage for your reel. So you might be able to use that as news right there! But here is where most actors fall short. When the shoot has wrapped, when the screening is over… a lot of actors never talk about their projects ever again. That is where recycling comes in. “Just because something feels like old news to you, it does not mean that it is old news to everybody else. So recycle, recycle, and recycle. Putting one post on Twitter and then never talking about the great film you starred in ever again, probably isn’t gonna cut it. So think of new things to report and cool ways to recycle each job. You can compliment cast & crew from your past projects on social media. “Congrats to the super talented “Jane Smith” who played my best friend in the film “RomCom” She is now starring in XYZ’s awesome new pilot “She booked It”. The reason posts like this are so great is that they are completely positive energy. Plus they hit on multiple points in one quick statement. A post like this is win win win… It is good for you, good for your friend Jane, good for your “RomCom” film that you did a long time ago, and even good for Jane’s new show “She Booked It”. Makes sense? So take a minute and go revisit your old projects by looking at your resume, your reel, your website and come up with some new news about something you did in the past. This one actor tool can open up a whole new world of press opportunities for you! Congrats and start recycling!